THE WORLD’S FIRST SELF-ADJUSTING INSULIN PUMP SYSTEM. The MiniMed® 670G system^ offers SmartGuard® Auto Mode, the only technology that mimics some of the functions of a healthy pancreas by providing two levels of insulin delivery for type 1 patients 7 years or older. In SmartGuard Auto Mode, it constantly adjusts your basal background insulin automatically every 5 minutes based on your CGM readings. Medtronic’s (real-time) continuous glucose monitoring (CGM) products are indicated for use by people living with type one diabetes. 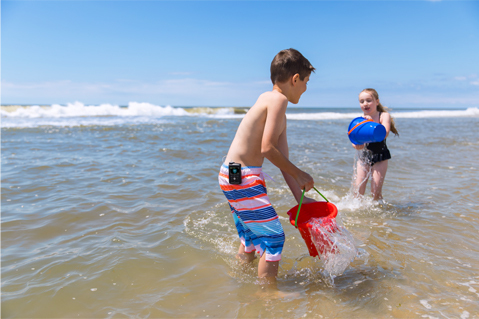 Guardian™ Sensor 3 may also be used as part of the MiniMed® 670G system^ for people living with type 1 diabetes age 7 and up. Waterproof pump, protected against the effects of being underwater to a depth of up to 3.6 meters (12 feet) for up to 24 hours. The pump dimensions are approximately 5.3cm width x 9.6cm length x 2.4cm depth. The weight of the pump is approximately 85 grams. Medtronic Diabetes provides a variety of infusion sets to fit your needs. Used with your pump for Continuous Glucose Monitoring (CGM). A device that connects to a glucose sensor. The transmitter collects data measured by the sensor and wirelessly sends this data to monitoring devices. 0 to 35 units per hour or the Max Basal Rate amount, whichever is lower. Used with your pump for CGM. The sensor is a small part of the continuous glucose monitoring system that you insert just below your skin to measure glucose levels in your interstitial fluid. Used to upload system data to the diabetes management software using a USB port on your computer. The pump requires one new AA (1.5 V) battery. For best results, use a new AA lithium (FR6) battery. The pump also accepts an AA alkaline (LR6) or a fully charged AA NiMH (HR6) nickel-metal hydride rechargeable battery. The MiniMed® 670G system^ comes with a compatible meter. It wirelessly connects to your pump, allowing you to send BG meter readings to your pump. Sleeping soundly. Waking up energised. The MiniMed® 670G System^ lets you wake up every morning well-rested and ready to take on the day. Having more time for family and friends. YOUR PUMP. YOUR STYLE. YOUR WAY. Soft belts and pouches can be sized for the perfect fit and give you a comfortable way to keep your pump close and concealed. They can be worn on different parts of your body - the arm, waist, thigh or leg - discreetly under clothing. With our selection of cases and clips, there are many ways to wear your insulin pump. You can attach your pump to your waistband or belt, protect it in your pocket, or even clip it under your clothing. Inspiring news. read all about it. ^ Components sold separately. Automated insulin delivery is made possible through combining Medtronic insulin pump and continuous glucose monitoring technology. # Based on sensor glucose. The MiniMed 670G system is intended for continuous delivery of basal insulin (at user selectable rates) and administration of insulin boluses (in user selectable amounts) for the management of Type 1 diabetes mellitus in persons age seven and older requiring insulin as well as for the continuous monitoring and trending of glucose levels in the fluid under the skin. The MiniMed 670G system includes SmartGuard technology, which can be programmed to automatically adjust delivery of basal insulin based on continuous glucose monitoring (CGM), and can suspend delivery of insulin when the SG value falls below or is predicted to fall below predefined threshold values. The Guardian Sensor (3) is not intended to be used directly for making therapy adjustments, but rather to provide an indication of when a fingerstick may be required. All therapy adjustments should be based on measurements obtained using a home glucose monitor and not on values provided by the Guardian Sensor (3). The safety of using Auto Mode, Suspend before low, and Suspend on low in people who have no pump experience is not known. Auto Mode, Suspend before low, and Suspend on low should not be used if insulin pump settings have not been previously established. Insulin pump settings include basal rates, insulin to carb ratio, or insulin sensitivity factors. Always discuss with your healthcare professional before using Auto Mode, Suspend before low, or Suspend on low. Do not make treatment decisions, such as determining your insulin dose for meals, using the MiniMed 670G system CGM values, as they are not intended to be used to make such treatment decisions. The MiniMed 670G system CGM does not replace a BG meter. Always use the values from your BG meter for treatment decisions. BG values may differ from SG values. Using the SG readings for treatment decisions could lead to high or low BG. Do not use Auto Mode for a period of time after giving a manual injection of insulin by syringe or pen. Manual injections are not accounted for in Auto Mode. Therefore, Auto Mode could deliver too much insulin. Too much insulin may cause hypoglycaemia. Consult with your healthcare professional for how long you need to wait after a manual injection of insulin before you resume Auto Mode. The MiniMed 670G system is intended for continuous delivery of basal insulin (at user selectable rates) and administration of insulin boluses (in user selectable amounts) for the management of Type 1 diabetes mellitus in persons age seven and older requiring insulin as well as for the continuous monitoring and trending of glucose levels in the fluid under the skin. 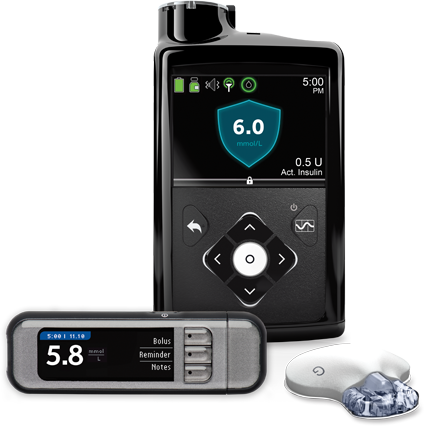 The MiniMed 670G system includes SmartGuard technology, which can be programmed to automatically adjust delivery of basal insulin based on continuous glucose monitoring (CGM), and can suspend delivery of insulin when the SG value falls below or is predicted to fall below predefined threshold values. The Guardian Sensor (3) is not intended to be used directly for making therapy adjustments, but rather to provide an indication of when a fingerstick may be required. All therapy adjustments should be based on measurements obtained using a home glucose monitor and not on values provided by the Guardian Sensor (3). Medtronic performed an evaluation of the MiniMed 670G system and determined that it may not be safe for use in children under the age of 7 because of the way that the system is designed and the daily insulin requirements. Therefore this device should not be used in anyone under the age of 7 years old. This device should also not be used in patients who require less than a total daily insulin dose of 8 units per day because the device requires a minimum of 8 units per day to operate safely.